Courtney's favorite ideas for dressing up the table for memorable meals. I love to take the time to set an elegant, inspired table for guests to enjoy. So much so, that the menu is often runner-up after the flowers, place settings and ambience. Whether you’re setting a table for two or 20, there are a few things you can do to create an inviting and unforgettable table for your guests. A few sweet touches can make sitting down with company a magical experience! Low centerpieces, like these arrangements of peonies, will never get in the way of dinner table conversation. 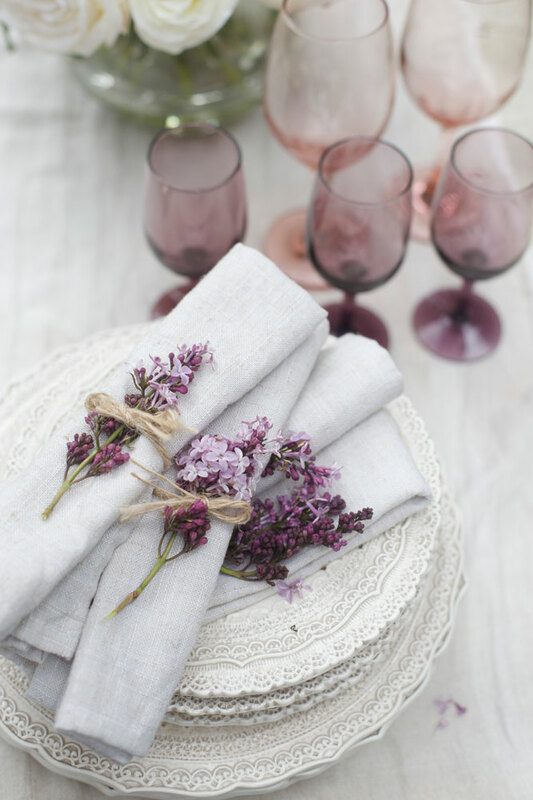 Although small, these blossoms make a big impact when paired with neutral napkins. Whether it’s a garland of greens with flowers tucked inside, several small vases running the length of the table or even a single beautiful bouquet, you can’t go wrong. Think about your colors and what flowers are available during that time of year. 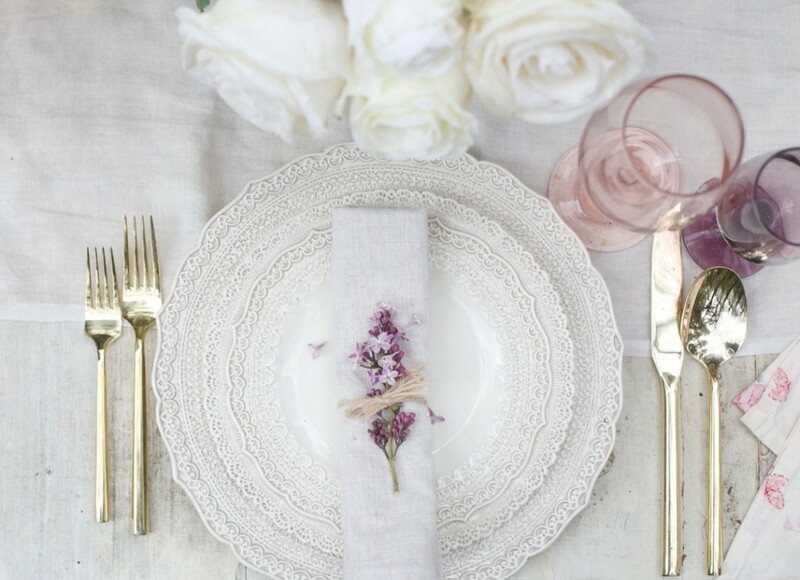 From delicate and detailed to vintage, create special place settings for each guest. I like to include a small sprig of flowers and herbs tied to a napkin as a welcome. Lighting is key for adding ambience: candles on the table, twinkle lights in trees and LED candles in lanterns to light steps and paths. Add some music in the background, and enjoy a romantic evening. This blend of two fall coffeehouse favorites will have you playing your own barista. Cinnamon chai spice and everything nice makes for a tasty take on the classic pumpkin spice latte. When the line in Starbucks is just too long, don’t you just wish you could make your own pumpkin spice latte? Take one super-spiced sip of this take on the PSL topped with maple-sweetened whipped cream and you’ll be addicted! 1. For the whipped cream: In a medium mixing bowl, whip the heavy cream to stiff peaks. Add in the maple syrup and whip again. Taste and add more maple syrup if desired. Chill until ready to use. 3. Pour the latte into Irish coffee cups or large mugs, top with whipped cream, a sprinkling of ground cinnamon and a star anise if desired. Serve immediately. With a glaze infused with bourbon, this cake is about to become your new fall favorite. Beautiful and boozy, this pumpkin spice bundt cake will be the perfect centerpiece for your fall table. That crispness you sense in the air means it’s time to start thinking about your fall baking plans. If you’ve got a beautiful bundt pan you’ve been itching to use, pull it down from the top shelf and get to making this amazing crowd-pleasing cake. 1. Preheat oven to 350°F. Grease and flour a 12-cup bundt pan. Set aside. 2. To make the filling, in a small bowl, combine all of the ingredients and mix with your hands until the butter is brown down into coarse crumbs the size of peas. Set aside. 3. In a large bowl, combine the flour, pumpkin pie spice, baking soda, baking powder, and salt. In the bowl of an electric mixer, cream together the butter and sugar on high until light and fluffy, about 5 minutes. Add the eggs, one at a time, mixing well after each addition. Stir in the vanilla extract. Add the pumpkin purée and mix until evenly incorporated. Add the dry ingredients in three batches, alternating between the sour cream and dry ingredients. 4. Pour half of the batter into the prepared bundt pan. Top with the filling and then add the remaining batter, making sure to spread it out evenly. Bake for about 1 hour or until a toothpick inserted in the middle comes out clean. Remove from oven and allow to cool for about 30 minutes in the pan. Run a knife along the edges and middle and then carefully invert onto a cake plate or stand. Allow to cool down completely. 5. To make glaze, whisk all of the ingredients together in a large bowl. If too thin, add a bit more powdered sugar, or if too thick, add a splash more milk. Pour the glaze over the cake and sprinkle with chopped pecans. Cut and serve. It's all of your favorite flavors rolled into one incredibly decadent statement dessert. Even if you aren’t the biggest cheesecake fan, trust us—this one is irresistible. Thick, velvety and rich, this king of all pumpkin cheesecakes sits atop a royal crust made of irresistible chocolate cookie. Top it all off with a salted caramel sauce and you’ve got a decadent experience for even the most discerning pumpkin aficionado. 1. Preheat the oven to 350°F. Cover the outside of a 10-inch spring-form pan with aluminum foil. Place in the freezer until ready to use. 2. For the crust: In the bowl of a food processor, combine the wafers and sugar. Pulse until finely chopped. Add the butter, and then pulse once more to combine. The resulting mixture should be wet. Pour it into the prepared pan, and press down to form an even crust, just barely coming up the sides of the pan. Place the pan back in the freezer. 3. For the cheesecake: In the bowl of a stand mixer, cream together the cream cheese and granulated sugar until light and fluffy, about 5 minutes. Add the pumpkin purée and pumpkin pie spice, and stir until evenly combined. Add the eggs, one at a time, mixing well after each addition. Stir in the milk. 4. For the salted caramel: In a large saucepan, mix the sugar and water until combined, and then bring to a boil over medium-high heat. Cook, untouched, for about 3 minutes, or until deep amber in color. Stir in the heavy cream (it will splatter a bit) and continue to whisk until fully combined. Stir in the butter, vanilla and salt. Remove from the heat and allow to cool slightly. 5. Remove the crust from the freezer and pour in half of the caramel on the bottom. Sprinkle with half of the toffee pieces and then pour in the cheesecake batter. Bake for about 70 minutes, or until the edges are golden brown and the center is somewhat firm. (It should still jiggle a bit.) Remove from the oven and allow to cool completely. Chill before serving. 6. 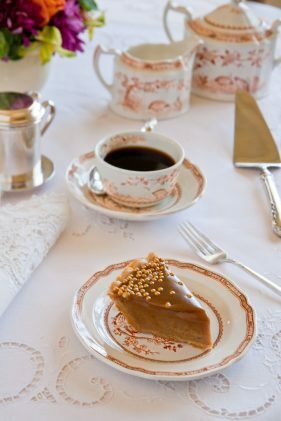 To serve, pour the remaining salted caramel on top and sprinkle with the remaining toffee pieces. Cut and serve with whipped cream. Aqua, teal and blue are the obvious colors when it comes to a sea-inspired palette. When it comes to summer entertainment, what better way to celebrate than with an ocean-themed luncheon or dinner party? Here are 10 elements you can use to throw the ultimate romantic seaside party. Rustic table. Any wood left outside will weather, but near the ocean where there’s more salt in the air, the aging process happens more quickly. Celebrate the rustic nature of the sea with a weathered wood table as the foundation for your party. 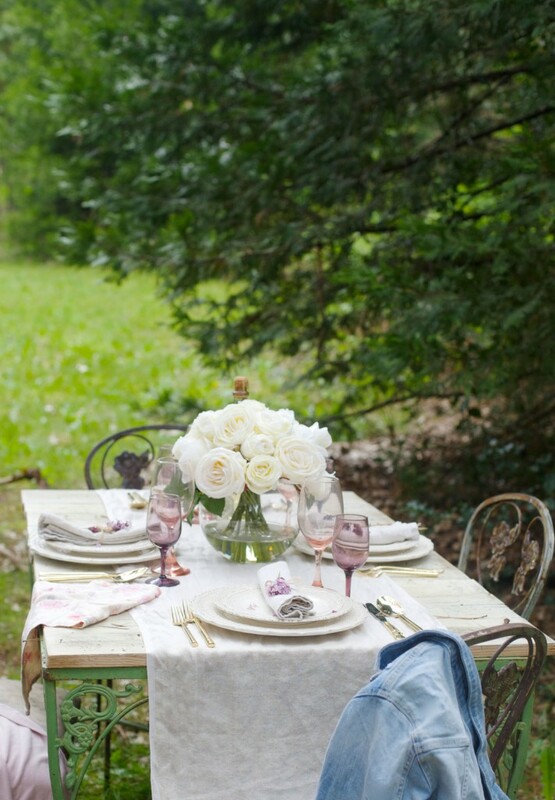 If you want an upscale feel, pair the rustic table with elegant wrought-iron chairs. Ocean color palette. Aqua, teal and blue are the obvious colors when it comes to a sea-inspired palette. But don’t just stick to one shade. The color of the ocean changes, depending on location—from the clear aqua of the Hawaiian shoreline to the royal blue of a California beach and the light gray of a stormy day in New England. Use many shades of blue and green to reflect all the colors of water. 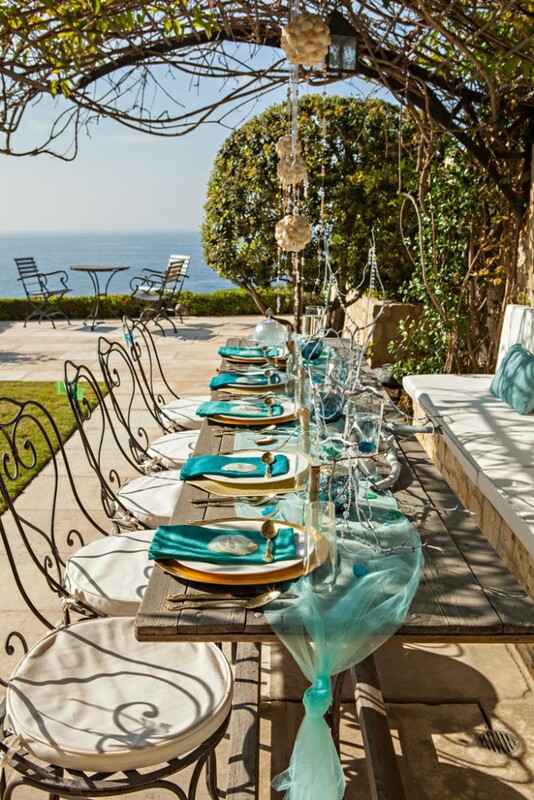 Using different shades of blue and a gauzy table runner all contribute to the ocean feel. Sea texture. Don’t stop at color—recreate the texture of the ocean too. Use a gauzy table runner that looks like the foam on the crest of a wave, or scatter sand as part of your centerpiece. Have guests come barefoot to the party, or give them a pair of flip flops as if you really were at the beach. Gold elements. Gold is the perfect complementary color to aqua, perhaps because of legends of mermaids who wear gold crowns and ruby necklaces from sunken ships. 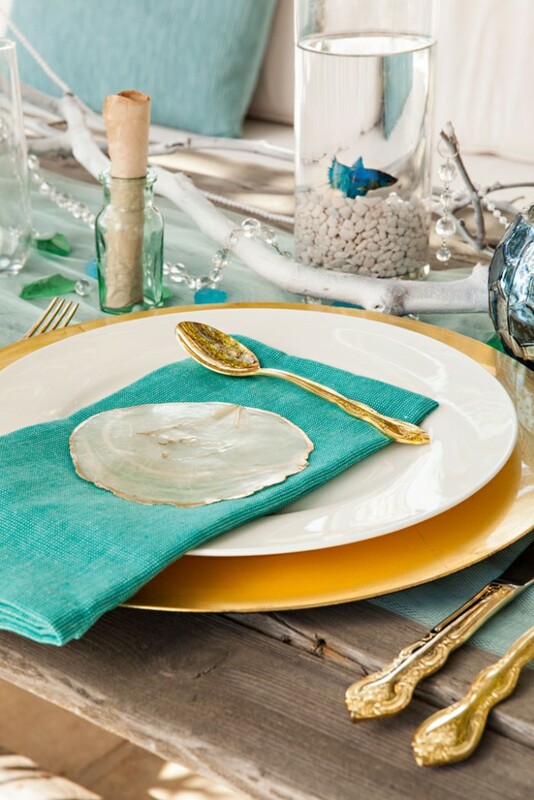 Use gold as a layering color, through chargers under the plates, cutlery and even salt and pepper shakers. 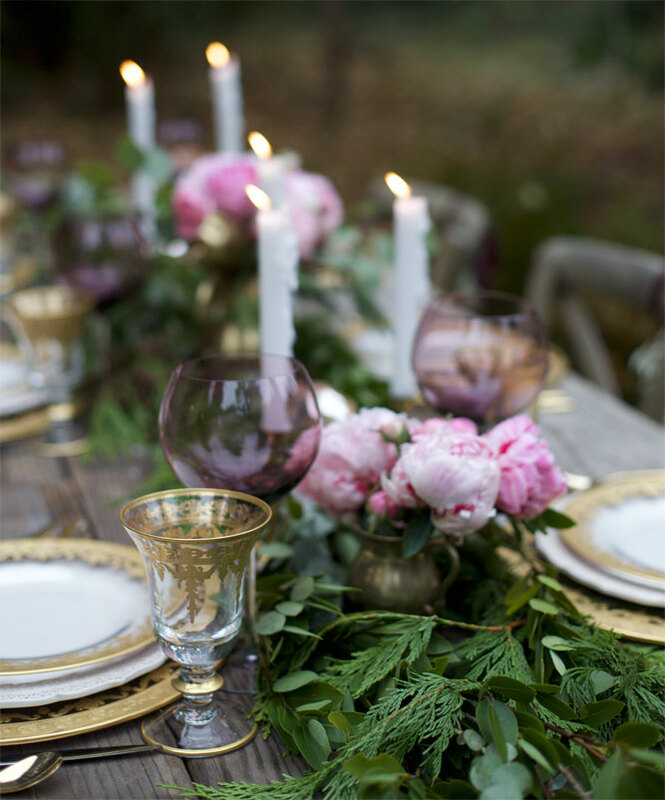 The magic of this table setting is in the whimsical details like gold accents, strings of glass beads and pale driftwood. Driftwood. It’s beautiful and it recalls the power of the ocean to smooth away rough edges. Use driftwood as part of your centerpiece, or tie short sticks around a candle with twine for rustic lighting. If you don’t have access to driftwood, you can make your own. Collect a few fallen branches; then sand or chisel off the bark to create a smooth surface. Finally, add a coat of white paint to recreate the sun-bleached look. Sea shells. These are a given for an ocean theme, and you can use shells in creative ways. 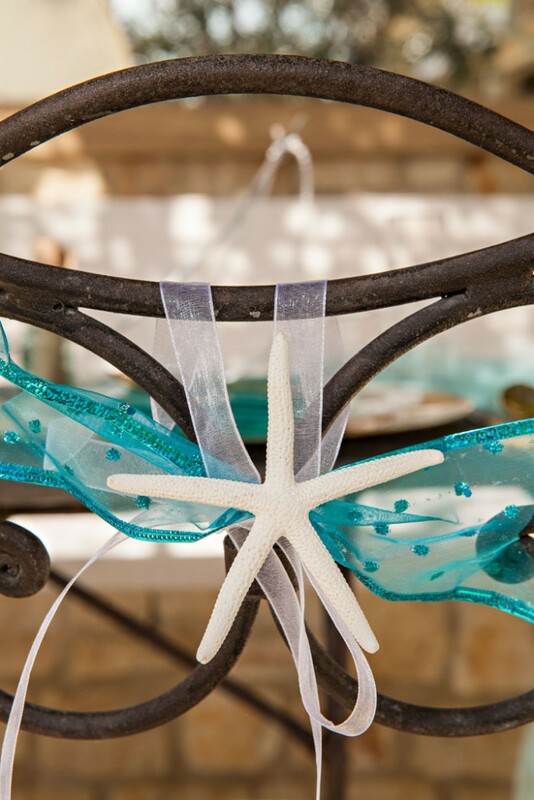 Tie a sea star onto the back of each chair, or paint the names of your guests on a scallop or buttercup shell to use as seating cards. Hot glue a layer of tiny shells onto several Styrofoam balls and hang them with clear fishing wire above your centerpiece. A white sea star tied to a rustic chair with ribbon makes a perfect seating statement. Sparkly accents. Have you ever noticed that on a sunny day, the ocean sparkles as if a million diamonds were shifting on the surface? 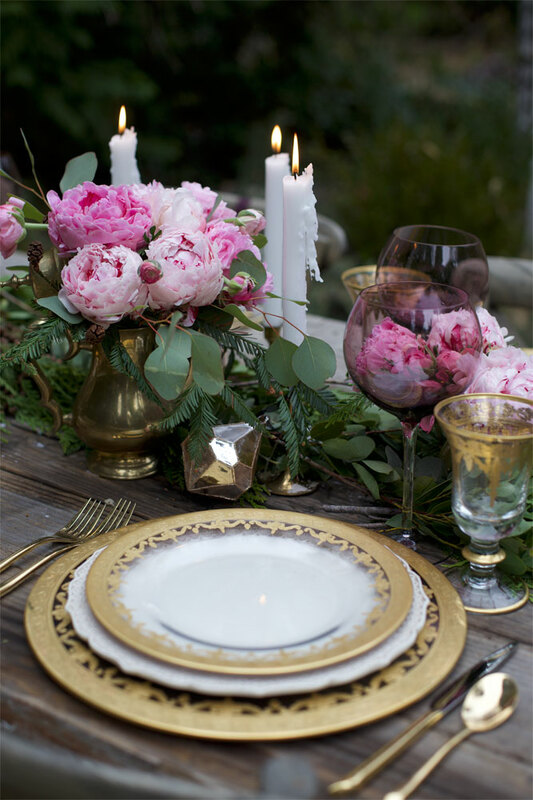 Add sparkly items to your table to recreate this feel. Drape strings of glass beads over driftwood, or fill the crook of a conch shell with crystal gems to catch the sunlight. Sea glass. 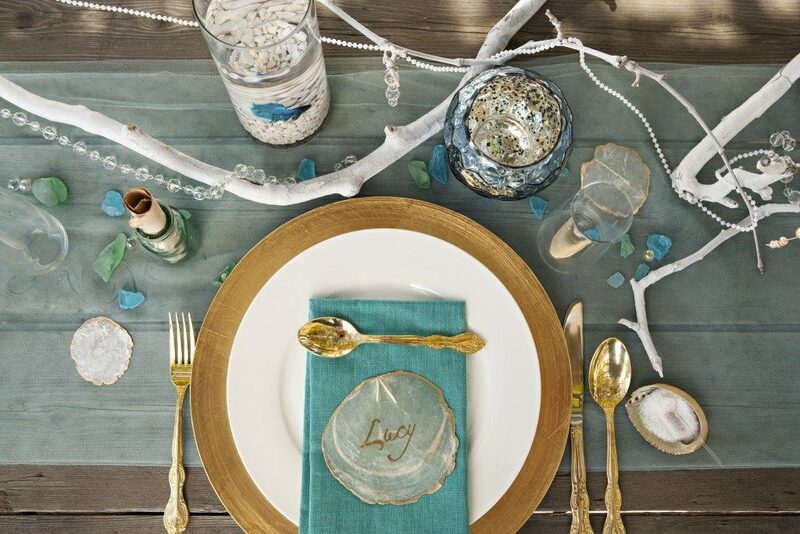 Sea glass is a treasure to find, and you can use it to add both sparkle and color to your table. Drop individual pieces amid your centerpiece to add an additional layer, or add a few pieces to your collection of sparkly gems. You could even use green glassware to serve lemonade and champagne. 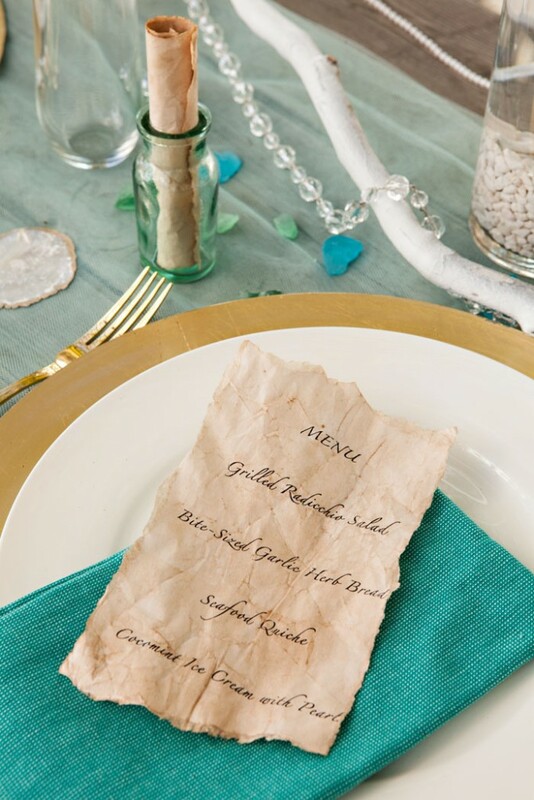 Get creative by making an old sea map-like menu. Not only will your guests be delighted to know the menu, but they’ll also love the unique detail. Treasure menu. Part of the excitement of a trip to the beach is the possibility of finding treasure or a message in a bottle. Give your guests this thrill with a menu you’ve aged, rolled up and placed in an apothecary jar. To age your printed menu, dip it in tea to stain it, repeatedly crumple and flatten it to give it a soft feel and rip the edges to make it more rustic. Sea creatures. If you want to go the extra mile, include live sea creatures as the stars of your centerpiece. 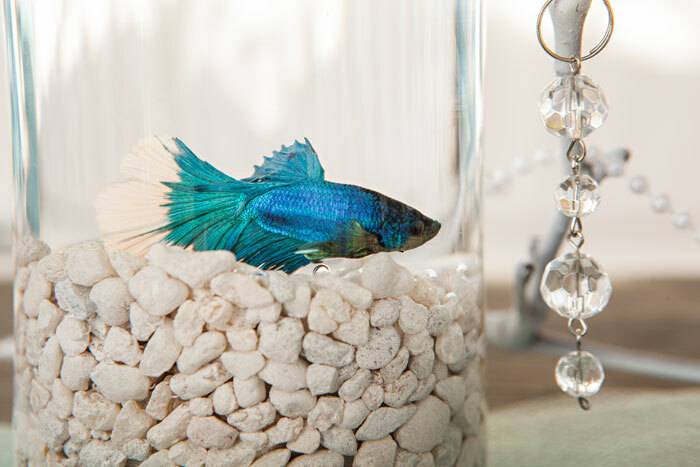 Fill a clear vase with a layer of pebbles and dechlorinated water; then add a goldfish or betta fish. You could even add a hermit crab as a companion. This magnificent fish, with multiple hues of vibrant blue, is a true table finisher. Spread the spirit of the holidays with the gift of sweets. They say the way to a person’s heart is through the stomach. The right food will win over just about anybody. A few cups of flour and some sugar can do wonders for your social life. This woman should be on the top of your cookie-giving list. She makes or breaks your holidays. If you over-season the turkey at your next Thanksgiving dinner, she will remember that one time you made her a delicious batch of cookies and remain silent. On the flip side, maybe you are the mother-in-law. In that case, catch your younger in-law off-guard with cookies so sweet and mouthwatering that he or she will have no choice but to endure your favorite story, for the hundredth time, at the family holiday party. Maybe you don’t want to turn on your Kitchenaid for that person who keeps harassing your cubicle. But your not so kind boss will take more kindly to the possibilities of a promotion when surprised with freshly-baked chocolate chip cookies. Yummy confections will transform Janet’s smug smirk into a genuine smile. After tasting your baking prowess, your office rival might just let you in on a few office secrets. This also applies to your painting class, gardening club, or whatever group activity it is that you do. Give the star student cookies and he or she might just let you into the elite circle, also comprised of the second and third best students. Soon your praying mantis pose will just be as polished as the class protégé’s. Don’t let your significant other have too much cookie dough. Save some for his pals the next time they come over for a football game and watch them magically clean up after themselves. Whoever leads your child’s (or grandchild’s) recreational activity, make sure to give him or her a bag of treats. It won’t be a coincidence when you see your little one move up a row in his or her Nutcracker recital. Don’t forget the kiddos! Making enough cookies for your child’s class isn’t as daunting as it sounds—each kid only really needs one cookie, and it will be worth it when your child comes home boasting a new friend or two (or forty). This is especially a great idea if your child is shy and needs an excuse to talk to his or her classmates. Give your mailman some cookies on his or her next route. You may stop experiencing the phenomena of finding your envelopes in your neighbor’s mailbox. Want to snag an invite to the envied neighborhood Easter party? Plant the seed that you’d be a wonderful guest and gift the best hostess on the street with scrumptious cookies. Ultimately, the holidays should be about selfless giving. Christmas time can be a particularly lonely time for many people. You could make someone’s holiday season a little brighter with a simple bag of cookies. 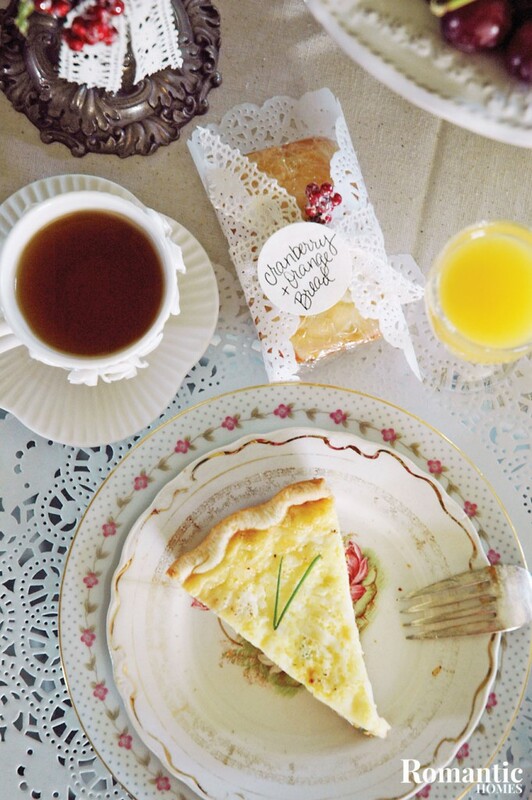 Gather to ring in the day with beautiful vintage wares and a tasty spread. Christmas morning can be a joyful occasion, and as loved ones gather around the table, you can contribute to the magic of the day with beautiful vintage wares and a tasty spread that keeps on giving. If you are looking to send your guests off with a small treat, homemade petite or mini bread loaves are simple yet thoughtful gifts. Use the gifts as part of your place settings at your table, or display them on a pretty cake plate or serving tray to be given to guests as they leave. Whether you choose a simple or sophisticated Christmas brunch, the idea is to help cultivate a sense of warmth and love that can often elude us during the busy holiday season. Reflect the special nature of the day by using your best vintage pieces like silver serveware, your grandmother’s china and your favorite cake stands. To create contrast, don’t be afraid to use items that show their history. A rusty galvanized bucket repurposed as a vase creates a lovely vignette of shabby elegance. 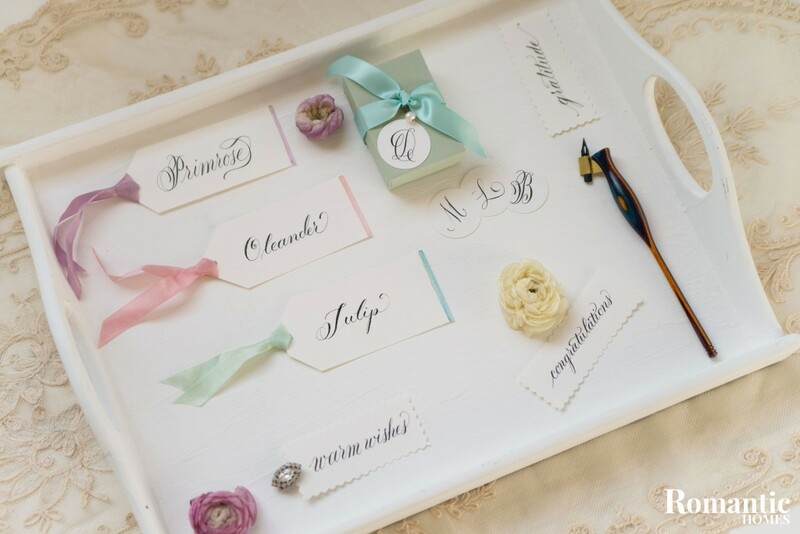 A vintage tin letter holder makes an endearing base for a place card setting. To top it all off, use lace ribbon, paper doilies and faux holly berries as accents for pops of festive color. 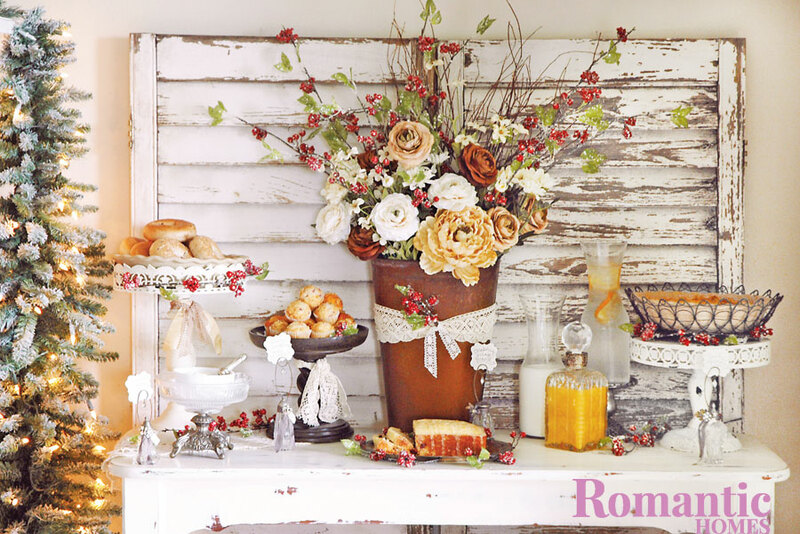 Just like your décor is a mix of styles, offer a spread with a variety of flavors, savory and sweet. This can be as involved or simple as you’d like. Make your own savory quiche or serve soft boiled eggs in those darling vintage egg cups you hardly use. For a seasonal treat and gift, use this delicious Cranberry Orange Christmas Bread recipe. Make in one loaf pan to include as part of your brunch spread, or if you bake them in a 9-cavity petite loaf pan, use them as individual sized favors. After wrapping them in cellophane to keep them fresh, simply wrap them with an inexpensive paper doily and secure each with a pretty ribbon and a small sprig of faux holly berries. Note: Leave fresh cranberries whole if baking large loaves. Preheat oven to 350°F. Spray a loaf pan(s) with cooking spray. Set aside. In a small bowl, combine the sugar and fresh orange zest. Use your fingers to rub the two together until the sugar becomes fragrant and turns a very pale shade of orange. Whisk the sugar mixture into the flour mixture. Set aside. Slowly pour the wet ingredients into the dry ingredients, stirring until just combined. Fold in the cranberries using a spatula. Pour the batter into prepared loaf pan(s). Bake according to the pan size you’ve selected or until a toothpick inserted in the middle of the loaf comes out clean. If necessary, loosely drape a piece of tin foil over the loaf pan to prevent overbrowning during the last 10 minutes of baking. Remove the bread from the oven and place it on a cooling rack. Allow it to cool for 10–15 minutes; then loosen the bread from the cavity using a knife or small spatula. Carefully lift and remove the loaf from the pan. Cool it completely on a wire rack. Prepare the orange glaze while the loaf is cooling. Combine powdered sugar, orange juice and orange zest in a small bowl. Whisk these ingredients together until smooth. Add more orange juice if necessary until an icing consistency is reached. Use a spoon or small whisk to drizzle the glaze over the bread. Slice and serve. Bread loaves can be stored for two to three days in an airtight container or in plastic wrap. Create presents that are just as special as what's inside with handcrafted gift tags. A fancy first initial is simple and elegant. Early bird gets the holiday shopping stress out of the way. If you do your gift rounds in advance, don’t finish them off with generic sticky “to and from” tags. You have extra time to make your presents more charming than the others—here is some inspiration to get you started. Using a calligraphy pen will upgrade your gift tag from tacky to elegant—even more so if you write your names in cursive! The fancy penmanship won’t even break the bank. 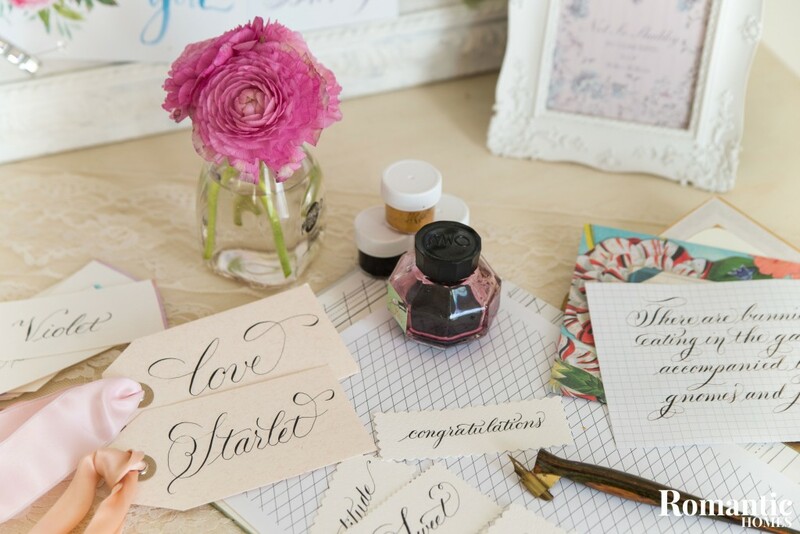 You can purchase an inexpensive calligraphy pen at craft stores such as Michaels. If you want your presents to be especially posh, top them off with an initial instead. 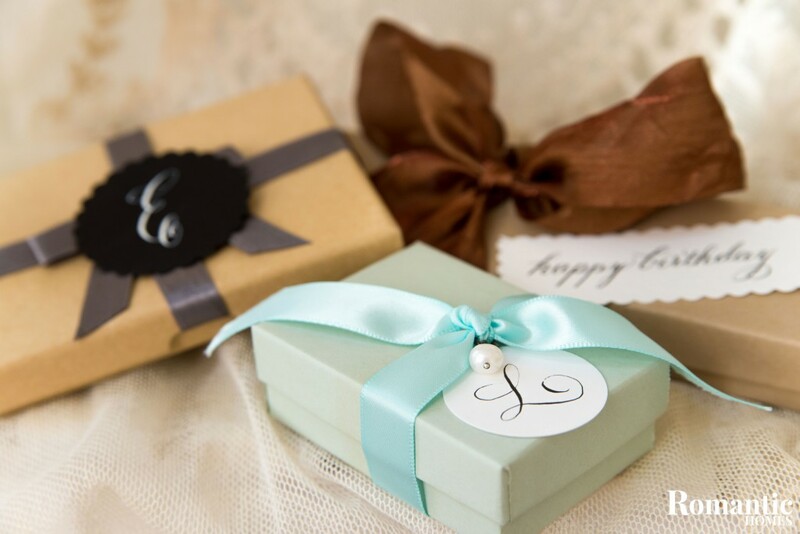 A gift tag bearing a single letter is more suitable for a smaller gift like a jewelry box. Paint a thin stripe at the edge of your tag, then tie color coordinated baker’s twine through a small hole on the opposite end. Make sure you are using watercolor paper when working with paint. Bristol smooth paper is a desirable alternative if you want to just stick to calligraphy. Finally, grab your decorative-edge scissors to cut scalloped or diamond edges on your paper tags for an extra pop of fun. Consider cutting initial-only tags into circles. A rectangular shape swallows a tag with only one letter. Your pretty tags don’t need to just sit on presents! Incorporate them into the actual gifts themselves. 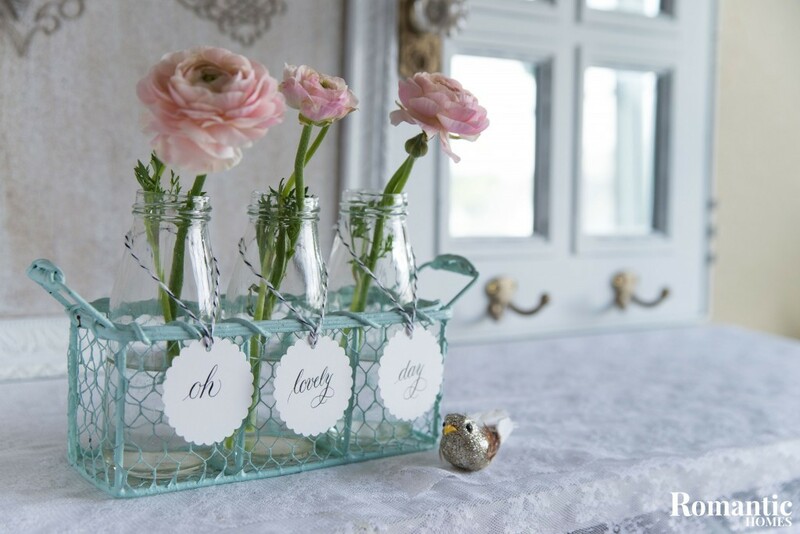 Instead of giving someone a bouquet of flowers, spread out your favorite saying onto different tags and attach them to flower vases. Place the vases into a tray like the one above for a romantic piece of windowsill or vanity decor, an easy DIY gift for loved ones. 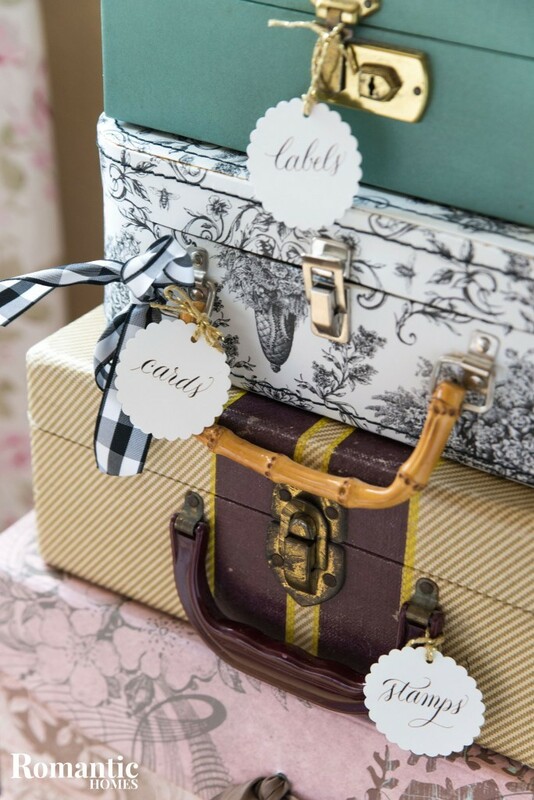 Another idea is to make suitcase tags—a smart gift choice, since many people flock to airports during the holiday season. These delicate tags will especially complement a vintage suitcase or storage chest. Top things off with the classic fall dessert: pumpkin pie. Want to skip the bourbon and go for a classic caramel flavor? Swap it out with 1 teaspoon of vanilla extract. It’s pumpkin season! As you savor your pumpkin spice latte and make your pumpkin soup, don’t forget to top things off with the quintessential fall dessert: pumpkin pie. 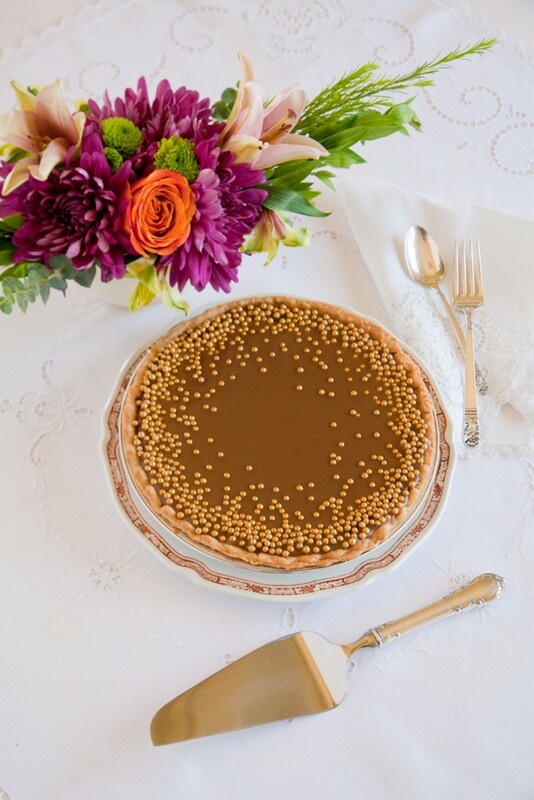 We could have kept it unadorned for a classic look, but instead, we opted for decadence with bourbon caramel topping. Even better? You’ve got options! This sauce is only one of four recipes for elevating a store-bought pie with home-made flavor! Roasted peptitas are an excellent alternative to gold dragées. Choose these for a hint of salt with your caramel and a more rustic look to the pie. Rich flavors call for thin slices. In a large saucepan over medium, heat the sugar, butter and salt until the butter melts and the sugar darkens around the edges, 3–4 minutes. Whisking constantly, slowly stream in the cream until well combined (some sugar will seize at first). Let the mixture simmer until it begins to thicken, about 10 minutes. Whisk in the bourbon and simmer until the mixture is just below the soft-ball stage (200–225°F) on a candy thermometer, another 10 minutes. Remove the mixture from the heat and let it rest for 1 minute before pouring it on top of the pie, tilting to spread the caramel to the crust. 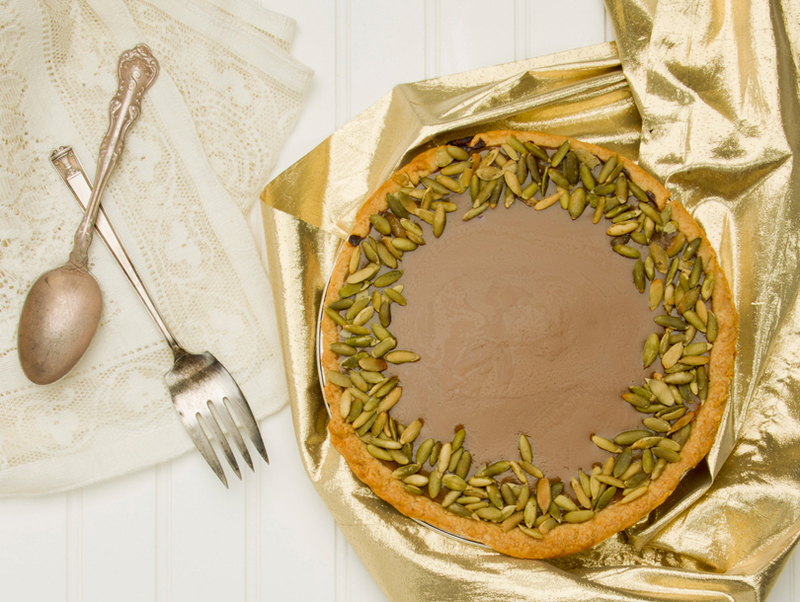 Let the caramel set for 5 minutes; then sprinkle on gold dragées or pepitas. Let pie chill for 1 hour before serving.